Thank you all so much for your patience as we have awaited for the divine timing to release these amazing beauties! The glass is really so nice and thick and you can feel how well they are made. Italian Glass is the BEST!! We have partnered with the same Italian producer as our Liter and Half liter bottles to bring you these bottles. It is truly a labor of Love for they are big and bold and heavy to transport. So many people have expressed interest in them that we had to do it! For you…for water…for blessing abundant amounts of water at once, helping to clear the frequencies that are not serving our planet or our own bodies of water. Five Liters is a great amount of water for a whole day of getting your Blue Solar Water charged up in the sun! Maybe you are wondering what is Blue Solar Water? Well this is some of the best water around!! Ideally you will fill your bottle with the best source of water you have available to you and set it in the sun to absorb the information from the sun as it passes through the Blue Glass. If the water is from your tap, that is OK….and hopefully you have invested in some sort of filtration system. It is important these days to research your water source and find the best water filter that fits your budget and will filter out the contaminants in your water. Ideally, we suggest you find fresh Spring Water if there is a spring near you. Look up www.findaspring.com to check your area. You can of course use these 5 liter bottles to go out and buy water at a water store or from a dispenser. If you do get Reverse Osmosis water, please be sure to remineralize the water. You can also check out the water structuring device on our site called the Jivara 3-in-1. It is truly amazing, but that is for another blog! Another way to understand Blue Solar Water would be to look into the teachings of Ho`oponopono. These teachings allow one the opportunity to make right on any wrong actions, negative thoughts or negative energy that we have created. There are several classes that teach this Hawaiian healing technique for clearing and cleaning energy. One of the tools for doing so is using Blue Solar Water to clear and clean everything! In doing so, it allows one to “clear memories from replaying in the subconscious mind and allows one to Let Go and Let God”. Once you have your bottle filled with water, you can leave it in the sunlight for 30 minutes up to 12 hours to really take in the information from the sun to make Blue Solar Water. You may want to leave it out overnight to cool off, unless the temperatures drop below freezing, so at that point, please bring your bottle inside! Frozen water will always crack glass…no matter how well made the glass is. Otherwise, you can use the refrigerator to cool off your water. With this 5 liter bottle, you can transfer the solar charged water into other water bottles of your choosing. The sweet taste, the smooth and silky feel, and the cleared frequencies of the water will carry over into the other container! If you have a Plain 5 liter bottle, then you can use the power of your thoughts to charge your water with whatever inspiration you choose for that day. 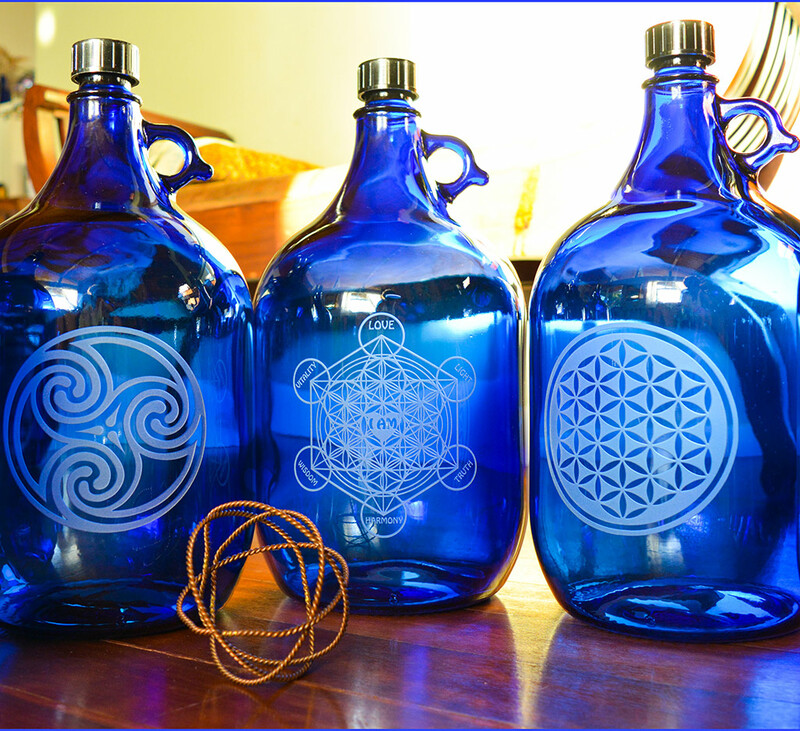 If you choose any of our amazing Sacred Geometry Sandblasted Designs, your water will carry that frequency throughout the day! If you do transfer your water to another container, you may want to be careful about what kind of music and or thoughts or words that the water is exposed to. We also have some beautiful and colorful stickers available in our Art Stickers section. If you are into the Blue Bottle Love lifestyle, you will carry one of our Liter or Half liter Bottles with you to keep on making Blue Solar Water throughout the day as well as inspiring others with your conscientious attention to your water. But we realize that not everyone feels comfortable carrying glass with them wherever they go. Also many people really love to have cold water all day long. This is understandable. That is why the HydroFlasks and other vacuum-insulated water bottles are so popular. What is really exciting to know is that the Blue Solar Water charge will be held inside the “other” bottle and you will be able to taste the difference! We had been planning to do this test for a while now, but just the other day, two of our friends were so excited to share their own taste-test experiment with their Blue Bottle Love water and their HydroFlasks!! They made a blind, side-by-side comparison using two of the same color Hydroflasks, one filled with filtered water and the other with filtered Blue Solar Water from Blue Bottle Love with Ganesh on the bottle. The results: There was clearly a noticeable difference in the two waters, and of course the Blue Solar Ganesh Water was preferred! Yay!! Great Big 5 LITER Water Blessings to ALL…..from Water With Love! !